GREEN VESTS dominated proceedings at the Berkshire Road Running Championships presentations at Bracknell. Although Roadrunners are encouraged not to indulge in triumphalism at times like this I’m afraid there was an air of …er, well, triumphalism. That’s because we took home two of the four men’s trophies up for grabs, thanks to Rob Corney and Alan Freer, as well as four of the end-of-season runners-up awards, through Pete Jewell, Alex Harris, Andy Atkinson and myself. Our ladies also bagged four medals for the four events which constitute the 2018 season, thanks to Gemma Buley, Helen Pool, Paloma Crayford and Helen Dixon. 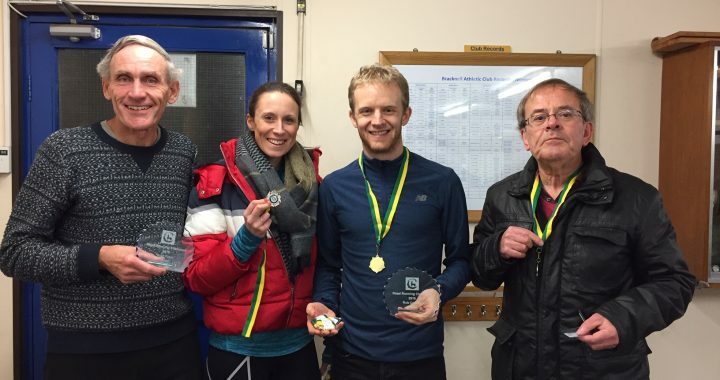 Alan (MV60) and Rob (senior men) had completed a clean sweep of victories in all four rounds of the competition – the Wokingham Half Marathon, Maidenhead 10, Marlow 5 and Woodley 10k. 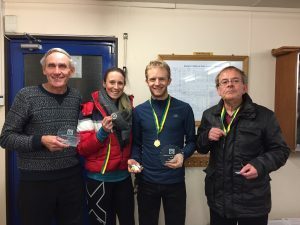 Alan has pledged to try to repeat his all-gold feat next season, and is one of several senior Roadrunners considering making a tilt at the England Age Group Masters team through the Fleet Half Marathon qualifying race in March. Alex Harris had to be satisfied with silver despite beating the eventual M50 champion, Wayne Lillis of Newbury, in all three of the races where they clashed. Similarly, Gemma was denied a nailed-on champions trophy when she missed the 10k race to support her husband, Chris, at the Brighton Marathon. 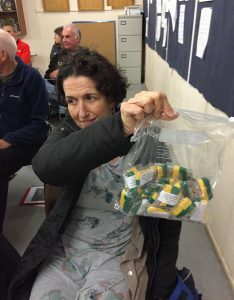 Ladies captain Sam Whalley was left to sort out and distribute a huge trawl of gold, silver and bronze medals won by Roadrunners throughout the season. Our other medallists during the season were Stephen Ridley, Ben Whalley, Lesley Whiley, Erica Key, Sarah Dooley, Sally Carpenter, Sarah Bate, Mary Janssen and Susan Knight. Sam (right) was too modest to mention that she had also won a medal herself. But she said: “I would like to congratulate everyone who won a medal or trophy. Men’s captain Phil Reay said: “The club has won several accolades in 2018 and it’s fantastic to see the trend continue with our haul of silverware in the Berkshire Athletics Road Running Championships. February 28th: Wokingham Half Marathon. August 11th: Burnham Beeches 10k. The 10k event, a multi-terrain race, is a new fixture for next year and the date is unlikely to please runners who takes their holidays in August. Similarly the Maidenhead 10 won’t suit everyone, coming as it does nine days before the London Marathon. When it was suggested that the Bramley 10 might be a better bet, that was pooh-poohed on the grounds that it was too close to the Wokingham race. The Maidenhead-VLM clash will deter a few veterans but won’t bother the young superstars like Gemma, who has vowed to target both. All details about the championships, which will include a new FV65 section in 2019, can be found at http://www.berkshireathletics.org.uk/content/2018-road-running-awards.